The eye-pleasing appearance of BELLISSIMA, Polish Pottery EX UNIKAT pattern, makes it a wonderful addition to your table top collection. This durable, chip resistant cereal bowl is an intriguing blend of form, function and timeless elegance. So many uses, beyond cereal so don’t limit the daily function you get with great Boleslawiec pottery. Use if for condiments, individual pot pies, biscuits and sausage gravy, and more. The EX UNIKAT patterns from Zaklady Ceramiczne BOLESLAWIEC exemplify the brilliance of Polish artistry and prove the depth of creativity that can only evolve over centuries. Blending the Polish traditional hand stamp technique with paint brushes transforms the once folk or classic look of Polish Pottery into modern day designs that will maintain the timeless beauty these artisans are known for creating. BELLISIMA depicts the beloved Poppy flower in rich Venetian red, celery & olive green leaves and kisses of ocean blue corn flowers all framed in a garland of elaborate floral accents in citrus orange, cobalt blue, chestnut brown and sky blue. In the background, complementing multi colored green leaves throughout create a realistic scene in a garden, while hints of yellow and black accent the poppy centers adding beauty to the overall design. BELLISSIMA is a limited edition pattern due to the labor intensity of EX UNIKAT designs and only a small group of Master Artisans are certified to paint EX UNIKAT patterns. This skill level, in the Master Artisans profession, is equivalent to producing museum quality productions to view behind glass. 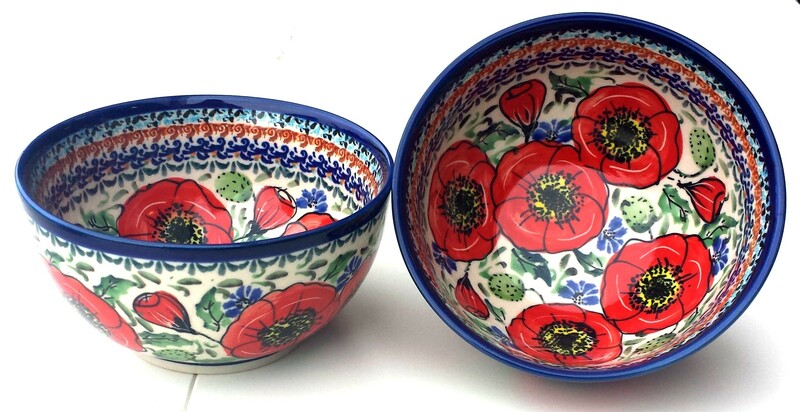 Pottery Avenue joyfully brings BELLISIMA to expand your Polish Pottery Stoneware collection knowing it will enrich and inspire your day to day routines and turn your home into a work of art, that you can use! The EX UNIKAT patterns from Zaklady Ceramiczne BOLESLAWIEC exemplify the brilliance of Polish artistry and proves the depth of creativity that can only evolve over centuries. Blending the Polish traditional hand stamp technique with paint brushes transforms the once folk or classic look of Polish Pottery into modern day designs that will maintain the timeless beauty these artisans are known for creating. BELLISSIMA depicts the beloved Poppy flower in rich Venetian red, celery & olive green leaves and kisses of ocean blue corn flowers all framed in a garland of elaborate floral accents in citrus orange, cobalt blue, chestnut brown and sky blue. In the background, complementing multi colored green leaves throughout create a realistic scene in a garden, while hints of yellow and black accent the poppy centers adding beauty to the overall design. BELLISSIMA is a limited edition pattern due to the labor intensity of EX UNIKAT designs and only a small group of Master Artisans are certified to paint EX UNIKAT patterns. This skill level, in the Master Artisans profession, is equivalent to producing museum quality productions to view behind glass. Pottery Avenue joyfully brings BELLISSIMA to expand your Polish Pottery Stoneware collection knowing it will enrich and inspire your day to day routines and turn your home into a work of art, that you can use! "BELLISSIMA 2 CUP BOWL"